If you were tempted to go swimming in the Willamette on Dec. 18, this sign on the Dave Clark Path near the Montgomery Street outfall was meant to dissuade you. 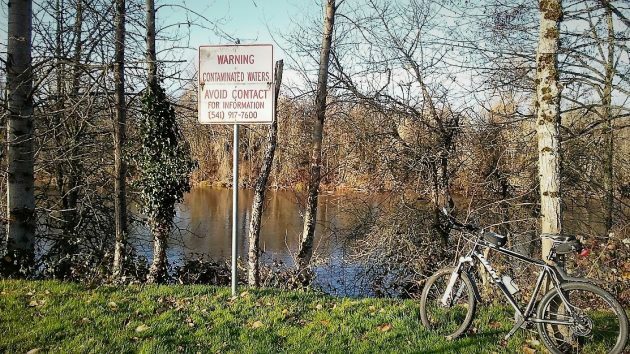 For years, the city of Albany has posted pollution warnings near sewer outfalls on the Willamette River when heavy rainstorms overloaded the system. To fix this, the city now expects to spend $13 million borrowed from the state. Not that anybody would be playing in the river during storms in the rainy season, when the overflows typically happen. Still, the Department of Environmental Quality frowns on the dumping of untreated wastewater. So Albany is prepared to deal with the overflows. The problem is that the Riverfront Interceptor, Albany’s largest sewer line, 8,713 feet long and 4½ feet in diameter at its downstream, is not big enough. It was built starting in the 1950s and drains the oldest parts of town, about 1,820 acres in all. The riverfront interceptor is a pipe deep underground near the river’s bank. Heavy rains have strained its capacity for more than 20 years. The overflows happen because of infiltration into the sewer system. This is a “standard challenge for sewer utilities,” City Engineer Staci Belcastro told the council in a memo last July. Because of its depth and location, replacing the pipe with a bigger one would be prohibitively expensive. Instead, the city plans to build a second pipe — a force main — through which a pump would push any extra flow toward the sewage treatment plant. To pay for this, the city last February accepted a $13 million low-interest loan from the DEQ. The pump or “wet weather lift station” and a generator will sit smack in the middle of what is now the Dave Clark Path west of the Wheelhouse parking lot. The path is supposed to be rerouted. Consulting engineers recommended that site over two others nearby because building the station there would be slightly less expensive. The new sewer main will follow Water Avenue from the pump station to Geary Street, then jog over to Front Avenue and follow Front to the treatment plant. In July, the council approved a $736,500 consulting contract with West Yost Associates, of Eugene, to design the project. When done, what happens to the current sewer inceptor running along the River? It stays and continues to work, without the threat of overflows. Will this $13,000,000 ‘investment’ increase the rating to “Excellent”? If the water quality won’t show a measurable improvement, then why do this project? Also, how much of a penalty will DEQ impose if this station is not built? $13,000,000+? The last paragraph in this tome is reminiscent of a Trump Tweet. Why spend the money to alleviate a “temporary” problem when the river’s already filthy and no one in their right minfpd is swimming due to weather concerns. Mr. Hering’s analysis seems just shallow enough to qualify as Trumpian. Wow…never miss an opportunity to bash our President ! Anytime it is prudent, smart citizens must go above and beyond to castigate the mindless buffoon currently controlling nuclear armageddon. Yes, Hasso can be very Trumpian. After all, he is a conservative Libertarian. He’ll come back at me with, “He’s not registered as a Libertarian.” No matter; that is what he is. Once the state takes over we are no longer permitted to a ask for a cost-benefit analysis. That is the reason public decisions are inherently less productive than private ones. Over time, how much per swimmer is just enough? Not to worry, scientists will tell us. City staff continues to keep busy by creating projects that really cost millions attempting to solve infrequent, non-earth-shattering issues. State law allowed the borrowing, as I recall, which over-rides our City Charter. Charter Amendment of 2013 requires a vote of the people for increasing City Debt. It passed with 81% yes vote. Council ignores the vote because they could. Aside from the essential maintenance of existing infrastructure, populations grow and sometimes require that we update our systems to accommodate the increased loads and strains on them. This is normal and should not be controversial. Sanitation is everyone’s responsibility. I am proud that we are doing our part, and we should expect others to do the same. Government is not indispensable when it comes to sewage and sanitation. Robust private property rights and voluntary exchanges in a genuine free market creates stronger incentives for environmental stewardship. Hasso’s articles on this questionable project enlighten us that the inherent nature of Government is waste and destruction. Government lacks the incentives of true ownership, willingly insulating itself from the true costs of its spending. Is this project essential? By what quantifiable measure? DEQ’s own measuring stick says spending $13,000,000 of taxpayer money won’t improve the quality of the river. And you are “proud” of this fact? God help us all…. Point me to an example of this happening. Hey, Mr. Shadle. I’d like to meet you halfway on this. Would you be willing to have an open conversation? The article may have been about the sanitation system, but from the way you focused on a generalized critique of government in your response, I’m guessing that the sanitation line is just the current example of a much larger problem you see in systems of governance. So instead of getting snarled in the details of the sanitation line at the moment, I’d like to just discuss the ‘big-picture’ stuff with you. What I’m seeing in your argument is the contention that systems of public governance are too deeply flawed, at their core, to manage communal life properly. As an alternative, you’re presenting a truly free and unrestricted market, so that things like enlightened self-interest, ownership, and profit motive can create a network of exchanges that can be trusted to naturally balance itself out and still take care of ‘public goods’ by harnessing the aggregate of these self-interests. I don’t want to argue with you about the merits of a system that is working perfectly as it is envisioned in its ideal form. In fact, I want to concede that, if everything went perfectly right, I bet that system could probably work. However, life is messy and, as I’m sure I don’t have to tell you, things don’t always work out the way we hope they would. I also believe that if a Marxist system of socialism was actually executed perfectly, it could work as well. However, as we’ve seen through well-documented history over the last century +, human nature is not ideal, and it interferes with the perfect execution of a system that sounds great in theory. While I would be the first to point out places where forms of socialism have succeeded, like the Scandinavian countries, I can also see with clear eyes that there are just as many, if not more, failed communist states (or ones that haven’t failed yet, but are clearly awful places to live). Furthermore, I can totally understand why someone would have hostile opinions about government. Progressives like myself do love us some government, but governing bodies have been largely terrible throughout most of human history. From royal rule to slavery, serfdom, tyranny, empire and more, government does not have a great track record. In all honesty it really does deserve a lot of the hostility that gets directed at it. Bearing that in mind though, there are a few other factors I believe are worth considering. 1: As much as we must all hate it sometimes, we are all stuck with each other. Humans are not a species of one, and we have to find some way to live and work together. This requires some level of social systems. Call it capitalism, socialism or whatever-ism, it is all a way to ‘govern’ the actions and patterns of communities of people. Even a system of enlightened, self-interested market forces depends on some behavioral norms. For example: It depends on people agreeing to the social contract that they will make economic exchanges for goods and services, rather than just taking what they want by force. 2: No system is perfect, and unsavory people will always exploit the weaknesses in systems for their own gain. Tyrants abuse monarchies, authoritarians abuse communist states, false prophets abuse religious structures, and robber barons abuse corporations and capitalist systems. After enough of this, people grow to resent the systems themselves, but it is always the humans exploiting systemic weaknesses who are actually causing misery. 3: Because systems have weaknesses that can be exploited doesn’t mean that we should burn the whole system down. Problems and inefficiencies exist, but we should seek to fix and improve them, not start over from scratch. If doctors found a tumor inside me, I would really want them to have a better treatment in mind than just throwing me in an incinerator. I think in the end, neither government nor market forces can bear the burden of all human interaction alone. There are certain realms where one is a better choice than the other, and vice versa. My hope is that we can stop fighting and start identifying where to deploy what system, and also work to improve them – to form a more perfect union. Regarding government I think of the City council every time I flush! That being said from an accused “naysayer”, I say count your municipal blessing friends. We do have a sewage system, we do have curbside garbage pickup, we do have an agreeable road system, we have constant electricity at the click of a switch, we have reasonably fresh water at our taps…So at this time of year when counting blessings of the season. At least be grateful we have what 1/2 of the world doesn’t!!. It’s gonna cost us no matter what. Bicker amongst us but don’t bash! Thanks Jim – Well stated. While it is clear that no one desires to pay taxes, there are some basic facts in play here. Federal law (Clean Water Act) directs that the City of Albany will strive to prevent untreated sewage from entering the waters of the State. Regulation aside, repairing or updating infrastructure also complies with the direction many of our mothers gave: clean up your own mess. On the technical side, I believe the City Engineer is correct: infiltration is a “standard challenge” for wastewater utilities. Clearly, the solution is not dilution, but repair and improvement to the systems. Arguments that depend on analyzing how many swimmers or boaters are using the river are based on red herring logic. Albany has a civic duty to prevent raw sewage from polluting the river. I would also argue that this is not a temporary problem, but a recurring one. Every time there are heavy rains, raw sewage goes into the river. The solution is not easy or cheap, but it is simple: fix your pipes. Thanks John – Spot on! Cordier and Shadle presume that government is inefficient. Shadle proposes that property rights and market forces will solve this particular issue. Market forces have little effect on property owned in common (rivers, roads, perhaps air). I remember people clamoring 10 years ago when the treatment plant was going to be upgraded, but no consideration was given to the condition of the interceptor pipe, the condition of which was known then (apparently even 20 years ago according to the City engineer) as it is now. About $70+ million was allocated at taxpayer’s expense to create a half-functional treatment plant (my understanding is that the solids part of the treatment plant has been a failure since 2009 and solids are still hauled to Coffin Butte at great expense). More money still needed to fix things in Albany and no solution/cost in sight for the solids issue. I’d be interested in an article by you concerning the status/cost of the solids fix. Hasso, Thank you for reporting this story. Did you happen to find out the terms of the loan from the State to fund this project? Just as an example… $13 million at 2% APR for a 5 year term will cost a total of +/- $1,040,000 plus any fees the State might require. That’s an average of just over $17,000 a month for the interest cost of this loan. Why does the City need to take a loan out for this project? Are they not allowed to set money aside for these types of projects? Would it not be a better value to the City Tax Payers if the City had set money aside for this project? Hope it all works out better than the talking water gardens fiasco. Will it lower my sewer bill, which is twice my water bill?